Need advice about a specific Audi A4 / S4 problem? Chart based on 7 repairs. See TSBs and recalls for the 2016 Audi A4 / S4. Chart based on 5 repair trips. The repair cost chart excludes repairs made under warranty, do-it-yourself repairs, and repair trips that include maintenance. 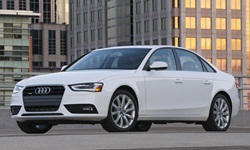 See repairs for all Audi A4 / S4 model years. 19000 mi Slow leak due to a crack in the plastic water pump. Water pump was replaced under warranty. Reverse camera display would flicker and turn off. Bad optical cable connector in the trunk. Connector was replaced. Clutch pedal creaks in hot weather. Clutch pedal was lubricated. It had little effect on fixing the problem. 21500 mi Bank 1 catalytic converter replaced. 47000 mi Recall for wiring on supplementary rear passenger heater. 31000 mi The entire MMI screen went blank. The dealer spent 3 days tracking down the problem and conferring with Audi. They replaced the 5F control module and reset everything. We lost all of our data. The $3,000 charge was covered by warranty. 36000 mi Owner adjusted the rearview mirror on the windshield and the mirror fell off - dangling by some wires. 38963 mi Engine Malfunction switch on the dash is on. NVLD Pressure switch broken - Fault P0456 on the EVAP system. Dealer removed and replaced the EVAP filter, EVAP canister and the NVLD pressure switch. Repair cover by warranty. 15000 mi Satellite radio "linking" with no sound. Diagnosed internal failure of roof antenna. Antenna replaced. 33000 mi Roaring noise from RR wheel. Replaced wheel bearing. US $115 MIL is on. Cause is P0299 turbo underboost (static) fault. Recommend turbocharger replacement. US $111 Purchased a SirrisXM external antenna from Best Buy for $29.99. Radio and traffic now work. Satellite radio “linking” and is inoperable. Rear section of the headliner was lowered and shark fin antenna assembly was determined inoperable. Dealer recommended replacing for $800. Customer declined and purchased a SirrisXM external antenna from Best Buy for $29.99. Radio and traffic now work. US $419 Roaring noise coming from the left rear wheel. Wheel bearing failed. US $3500 Trouble getting transmission in gear. Dealer replaced transmission. 40300 mi Squeak around shift boot. 19000 mi Squeaking rear shock bushings. 20700 mi After receiving Gearbox Failure and TPMS Malfunction warnings, vehicle was flatbedded to local dealer and entire 7sp DSG transmission was replaced based on diagnostics. Vehicle is 2.5 yrs old with 20K miles. 24000 mi Reported clunking resulted in replacement of a rear strut and replacement of front sway bars. US $600 Replace front brake pads and rotors Fuel door would not open. I needed to open it manually through the trunk. I haven't taken it in yet as it is not an emergency. It will be covered by warranty. 46000 mi Replaced front upper control arm bushings under warranty Replace fuel door actuator. 5120 mi 1 backup sensor would periodically fail to work and result in a long beep when car was in reverse. Tech pushed on a sensor and heard a "Click". Removed sensor cleaned the connection and re-installed. 6200 mi The aluminum panel on the left front door got loose so it made an annoying noise when cruising on highway. Took it to a dealer for and found that a screw inside that panel had got loose. Finally fixed it. 40300 mi Rear view camera intermittent. 40300 mi Chain tensioner failure resulting in chain rattle on cold starts. 40920 mi Error message "transmission malfunction, limited usability". Only 2,4,6 gears usable. Computer cleared, nothing repaired. 26000 mi Leaking water pump. 4000 mi CEL came on. Dealer had to R&R Manifold Absolute Pressure sensor. 41000 mi Slight rattle when engine revs. Dealer replaced front muffler under warranty. 15000 mi Sun visor clip broke with almost no force (I was returning the visor to its original position). Dealer replaced clip free of charge. Sunroof was excessively slow to close and stopped prematurely once. It appeared to be caused by too much friction on the sunroof track. 20000 mi Passenger side sun visor clip broke. Will take to dealer for repair. This part is made from candy canes. My driver side clip broke 6 months ago. Again, normal use caused this part to fail. US $480 Replaced broken passenger side visor clip. Dealer did this for freee. Rodent chewed through wiring for turbo boost valve and engine mount. Caused engine to operate with no turbo boost. Check engine light was illuminated. 17000 mi Squeaks in cabin. Dealer could not determine cause. Door seals squeak and rattle at rough roads. 42224 mi Both front, lower wishbones replaced (hydro bushings making noise). 50000 mi Engine rattle TSB performed. 28700 mi Exterior brightwork had become tarnished. Audi replaced at no charge. 13000 mi Indicated cooling failure; coolant was low. Inspected by dealer, coolant refilled, no other repair. 19700 mi Vehicle still has the same issue. At random once every month or so the brakes begin a loud grinding noise. This noise occurs without using the brakes. 24000 mi MMI system was replaced due to troubles connecting to satellites during NAV use. There was a TSB out for the issue and the dealership replaced quickly and at no cost. 19000 mi Replaced Antenna for MMI/Nav system due to slower location acquisition at start up. 30000 mi Nav system would randomly show car in wrong spot and would randomly clear XM stations (but not AM or FM) from the presets. US $160 Premature worn out of brake pads and rotors. First replaced at 15k. 8k later already down to 4 mm and rotors are warped. US $85 Rear backup camera failed. Need full replace of wiring harness and camera module. Good thing i have CPO warranty. 10420 mi Replaced drive shaft bearing . Noise still present. 5300 mi Second trip for same wheel bearing noise and this time dealer foreman confirmed. Bearing replaced and noise mostly gone, but still not perfectly quiet. 11000 mi Very light whistling/buzzing wheel bearing-like noise on highway sweepers @75mph+. One WB replaced, noise less, but continues. Not a huge deal, but surprising to lose at least two WB's in 11k miles. C $1200 Secondary air fault code (0491 on both banks). Typically comes on in cold weather and is caused by carbon build up due to direct injection. 16100 mi The trunk arm rubbed against the trunk covering on the right side. Audi adjusted the trunk covering so it did not rub anymore. 31200 mi Trim around dashboard was chipping. Dealer replaced trim under warranty. US $3200 Replaced clutch and flywheel. I had my car tuned with a performance chip, when that was done the clutch began slipping. I'm assuming it was a dual result, a worn clutch combined with the additional power overcame the clutch plate friction. When they did replace it, they said there was also excessive slop in the flywheel and there were warp marks on the flywheel too. 2580 mi Took car into Dealership after persistent calls to Audi Canada,, about Vibration on this new Car. Car was in shop, 1 week and result was no problem detected. still driving this Headache Lemon Car, with 7000km on it since Aug 2013. 5980 mi Plastic trim around led display squeaked. A technical service bulletin was released on this according to the dealer and the part was replaced at no cost. US $100 Replaced breather control valve. US $500 Battery replacement and other parts. US $1600 Spark plugs, fuel injector, replaced. Transmission reprogrammed, and valves carbon cleaned. 44000 mi Check engine light showed lean faults and low fuel pressure. Breather was leaking so breather valve was replaced along with fuel pressure sensor. After repair next day car flashed epc and check engine light came on. This time fuel pump was replaced. The flow of fuel was a little lower than what it should've been according to the tech. All happened only during moderate to hard acceleration. Check engine light again due to cylinder misfire under moderate to hard acceleration. Plugs replaced. Repairs finally fixed issue and engine running fine. 23900 mi Seat memory ceased functioning. Re-programming corrected the problem. US $90 Intermediate steering shaft & coupling replaced due to stiff steering when turning. 45880 mi Heating system preheated for cabin heat. Recall. 37200 mi Repair on rear window defroster. 36000 mi GPS would fail to find satellites after parking in parking deck. Would sometimes take over 40 minutes for system to find satellites on a sunny day. Software updates applied but problem was most prevalent in hot humid summer months. Driver seat exhibits clicking and creaking sounds as driver weight shifts. Mechanic tightened some things around the seat tracks, but noise persists. I believe it now to be in the hydraulic mechanism that raises the seat. 48200 mi Car struggles to start on hot summer days after a long drive. Applying gas pedal during long crank will allow the car to start. Once the car is cool there are no issues. Dealer failed to diagnose or fix. US $1000 Car began stumbling badly and threw a bunch of codes. Yellow CEL came on so I drove it straight to the dealer. Diagnosed as stuck fuel injector. Cost was $1200, but dealer did it for $1000. US $700 Front brakes & rotors. Stabilizer bar bushings on warranty. US $1500 Fuel injector #4 went out. Car was shuttering upon start if it started and had white smoke out the tail pipes. US $35 Replaced a broken sun visor clip. 8000 mi The passenger side airbag sensor would switch on and off with a passenger seated. The airbag could be turned on and off by slight shifts in body weight. 10000 mi The actuator that controls the locking mechanism for the gas lid failed, causing a loud buzzing sound on every attempt to unlock the gas lid. The gas lid was unable to be opened until repairs were completed. 19000 mi Rough idle followed by check engine light, and hard stuttering shortly after. Fuel injectors replaced but cylinder found to be cracked and leaking fuel/oil causing misfires. Engine replaced. US $700 Check engine light came on, found out it was for an air leak in the fuel injector. US $1900 Braking was becoming inconsistent, brake discs and brake pad sensor replaced. Engine mounts collapsed and leaking, replaced. Lower control arms failing, replaced under extended warranty. 98000 mi Check engine light, gas tank vapor valve stuck. Fixed. Replacement engine used one extra quart of Ultra Moly synthetic 5-40w over 10,000 miles. So far OK. In the next 10,000, used 2 extra quarts added over 10,000 miles between oil cnange. 117000 mi Ring Failure in Cyl. #2. Complete engine replacement. Dealer new engine is $9500 plus dealer labor. Likely $15000 cost. in process. This is a 2013 going on its 3rd engine. Complete new factory engine installed, 3rd one, tested and road tested by dealer. I kept the damaged engine for a rebuilder to bore & Nickasel plate the cylinders install custom pistons and rings for long mileage. Through the new break in. US $616 New engine and using a quart of oil every 1,500 to 2,000 miles. Replaced crankcase pressure control valve and a burnt spark coil plug wire. Asked for a compression test at my expense. Slowed to a quart per 3k. US $200 Replaced rear brake pads and torn brake piston boots. US $1000 Alternator went out. Audi supply chain 2 to 3 weeks from Germany. LKQ Salvage alternator took two trips to Sacramento. Crankcase pressure release valve also replaced third time third engine. C $1200 A road hum that started soft with acceleration and got louder with speed and time. I knew it would be pricey so I held off as long as I could. I thought it was only one rear wheel bearing, but turned out to be both. 1200$ later and it's a smooth quiet ride again. Yeesh. The wheel bearings were about 250 a side, killer. 15300 mi Continuous rattle in the steering column on textured pavement at over ~55 mph. Dealer added interior padding in steering column. Rattle continues but sounds slightly muffled after repair. US $86 Mechtronics unit for the DSG started to show nasty hesitation from Reverse to Drive. The car was also knocking into gear from a full stop. Audi reviewed, diagnosed and determined that the transmission should be replaced. Which was thankfully covered by warranty. 22000 mi Second Xenon Bulb failure; driver's side. 7700 mi Interior dash trip vibrates and rattles on uneven/rough roads and freeway surfaces. 25000 mi Crankcase valve sensor failed causing EPC error; repaired under warranty. C $65 Sway bar was loose making a creaking noise when wheel was turned. 5000 mi Rattle in center of dashboard and rattle in passenger door speaker. Speaker was replaced. 10000 mi Rattle near front passenger door/A pillar. 26400 mi Rattle in passenger door caused by broken door panel clips. Clips replaced by dealer. 16000 mi Bang and Olufsen speaker rattle. The mounting hardware was found to be broken. 33000 mi Audi dealer service dept refused to acknowledge loud rattle/vibration in undercarriage. Service tech took car joyriding and damaged rim. I traded the car in within 2 weeks of incident. 8000 mi EPC dashboard error. Cylinder 3 misfire (lost power and could just coast home). Dealer can't recreate problem. Couldn't isolate specific error and thus fix it. Got car back without any repair completed. 22200 mi Cap came off the back of the headlight and it injested water after driving through a puddle. It shorted out the headlight system and a suspension sensor. 31000 mi Steering had a notchy feeling at dead center. Hard to keep the wheel centered perfectly, it wanted to be either slightly right of center or slight left but not perfect center. Dealer replaced power steering unit. Fixed problem perfectly. 73000 mi Wheel had flat spot causing vibration. Wheel was repaired. 11780 mi Adaptive Headlight Defective. 1st Visit to shop control module changed, failed again later in day. 14260 mi A/C stopped producing cold air, no warning signs. Normal ventilation worked fine. Pressure Sensor failed. 33000 mi Driver side XENON bulb went out. 44100 mi Malfunctioning headlamp needed replacing. Jan 2013 Control module on water pump reported a failure. Pump physically working fine. Electronics failure so pump was replaced. Had to ship from Germany which what took the most time over Christmas/New Years. 20000 mi I heard a quiet drone when driving so I took it to the dealer, replaced wheel bearing for free under warranty, problem solved. US $2000 I had all four sets of pads and rotors replaced. 18000 mi Engine stalled intermittently at stop lights. No warning lights or fault codes. Dealer could not identify problem but adjusted air flow (?) and replaced battery in key. Problem has not recurred in three weeks. US $900 Water pump was leaking (approx 1 week for entire coolant system to drain). Solved after water pump replacement. US $600 MMI failed completely, no screen, no nav/radio. Dealer replaced MMI unit, no longer under warranty. 43000 mi AC not blowing cold air. Sensor was replaced. 28000 mi Clunk in front end. Dealer replaced lower control arms under warranty (TSB). 34300 mi Washer fluid leaking from passengers side headlight washer Washer fluid still leaking from passengers side headlight washer. Last visit, headlight washer pump was incorrectly idenified as source. part was replaced, nozzle still leaking. nozzle replaced this time, problem fixed. 40000 mi loose trim, likely left in that state from previous repair. Also, asked dealer to investigate clutch pedal squeak/creak when interior of car is hot - NFF on this request. Pedal creaks at top of travel but functions normal. 51000 mi Brought car in for occasional clunk in front end when backing into driveway. Diagnosed as bad lower control arms (already replaced once under warranty at ~28,000 miles) per tsk. Need to bring car back for actual repair once parts come in. US $4490 The clutch had begun to consistently "chatter" just before the it catches. Replace clutch. Also replaced flywheel, thrust bearing, and rear main seal since in there. Safety switch malfunction, found slight leak in clutch master cylinder. Master cylinder assembly replaced. See our lemon odds and nada odds page to see vehicles with no repairs or vehicles with more than three repairs. To see how frequently 2016 Audi A4 / S4 problems occur, check out our car reliability stats.